We’d like to hear your voice! Want to suggest an idea for a new feature? 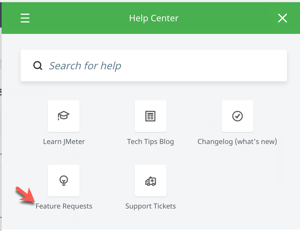 Just click the Feature Request button in the new Help Center sidebar. Everyone can submit ideas. Paid customers can also search, vote-up and subscribe to be notified of comments and status changes from within our new ideas portal. 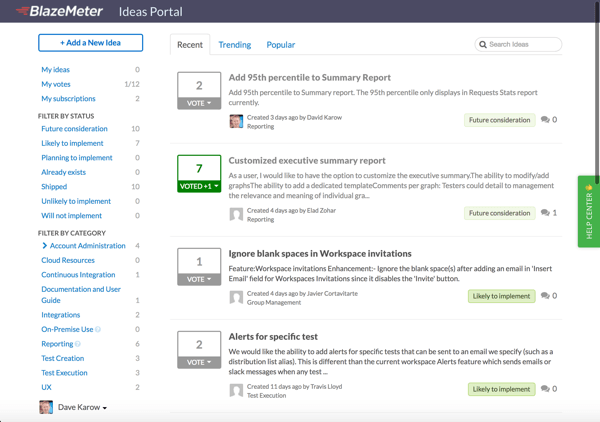 Learn more about the Ideas portal and your opportunity to impact our roadmap here. We continue to expand our geographic diversity. Recently we doubled our Azure locations and this week we are adding Google’s Sao Paulo, Brazil location. You can always see the full list by viewing the locations drop-down in an test create/edit screen. The Jenkins plugin for BlazeMeter is now workspace aware: select a workspace during job configuration to fetch tests specific to that workspace. We’ve also added average throughput and 90% response time to the metrics in the aggregate report. Details and previous updates in the plugin changelog on github. 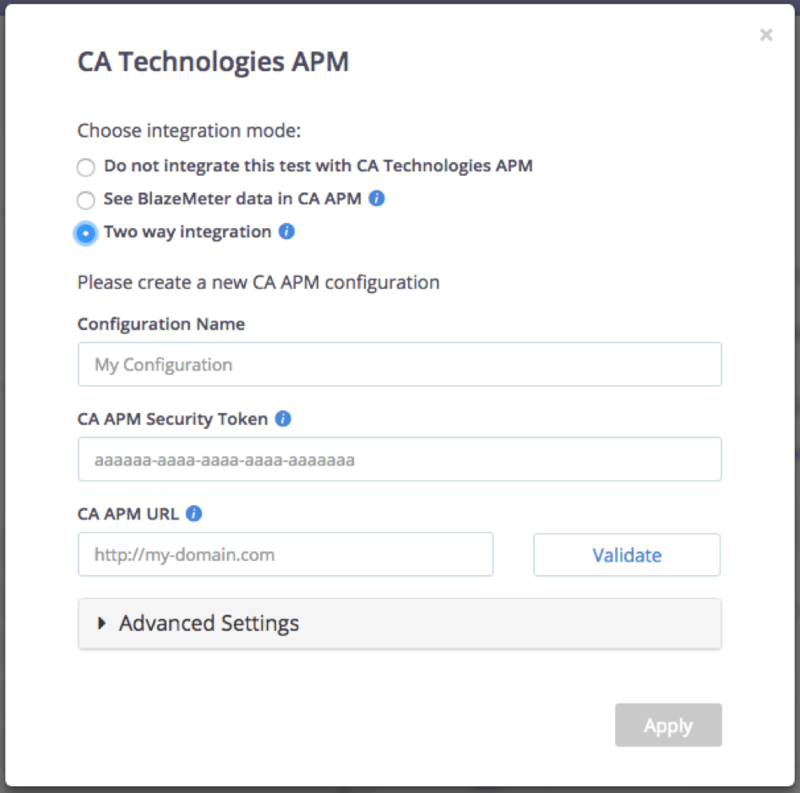 The APM integration for CA APM is now bi-directional and uniquely smart. It's our first integration to import APM metrics without requiring you to specify the metrics ahead of time. CA APM identifies the systems impacted as your test runs and automatically imports the relevant metrics for you. There's no better way to keep up with an always changing environment. Just point to your CA APM instance, launch your test and we’ll take care of the rest. Behind the scenes, BlazeMeter injects headers to your test traffic and CA APM determines which systems are impacted. CA APM then sends back the relevant metrics, which we make available in the Timeline Report. This new feature is layered on top of the existing outbound integration mode, where BlazeMeter test labels show up as Business Transactions in CA APM. We have renamed the “Throughput RC” button to “Change RPS” to make it easier to find. This button appears in tests where you have checked “Limit RPS” in the test configuration. It allows you to make mid-test changes to the RPS goal. See Limit RPS in the knowledge base for more detail. We have re-designed the Stop Test dialog to make it more likely you will choose the “Graceful shutdown” option over the more destructive option, “Terminate servers”. 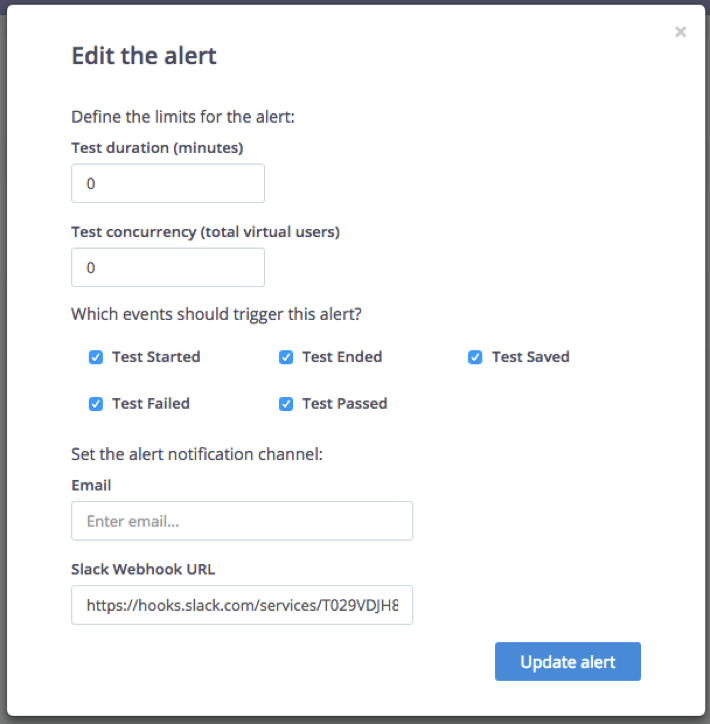 Workspace Alerts send alerts by email or Slack when test actions are taken and are triggered by size or duration thresholds. Now you can be notified of all test activity regardless of size or duration, by creating a Workspace Alert with duration set to "0" and concurrency set to "0". Tip: More detail on creating Slack Webhooks URLs for alerts has been added to our knowledge base. This button appears in Test Configuration screens if your account plan includes this feature. Clicking it creates a 9-location multi-test designed to meet Content Delivery Network provider recommendations for an accurate test. Contact support@blazemeter.com if you have questions about this feature. We have doubled the number of Azure locations, adding new locations in Korea, India, Australia, Canada, US and UK. Have a look at the locations drop-down to see them all. The Test Booting Screen is now updated with more information for improving your testing experience. We’ve added details about the test status, test name, script name, whether dedicated IPs are used and the status of each session - multi-location/multi-test. We’ve also enlarged the elapsed time indicator and moved links to learning resources to the bottom left. The New Private Location (On-premise Load) architecture enables easier installation. Are you testing your system behind a firewall? You’ll be happy to hear that we’ve made the installation process of our on-prem testing much simpler. The Usage Report is refined with more information. Note: You can enjoy the improved reporting abilities for data created as early as January 2017. The API Test Maker supports Open Authentication (OAuth). ​We’ve enabled adding OAuth tokens to your API tests. The API Test Maker supports model level test generation. ​We’ve added the ability to create tests for every operation in your API with the single click of button. The Quick Test in the API Test Maker supports Private Locations. ​We’ve enabled executing API Quick Tests by using Private Locations behind a firewall. The API Test Maker supports ad hoc changes to API Keys and Basic Auth. ​We’ve added the ability to make changes to the API Key or Basic Auth for your API tests without having to regenerate all of your tests. Your authentication changes are automatically applied to your tests the next time you execute them.